Tomorrow is already April and it is just crazy! I don't even know how this month went by that quickly?! We had the start of the new semester at uni and there was also a few days of Easter, plus I was working quite a lot this month. I think this is why I didn't even realise that the month is over already. If you're very busy you just seem not to feel that at all. But, as always at the end of each month I'm here to let you know about my most used beauty products of March. There's not many because I use all my regular products on a daily basis and they all are my faves but those ones are either new or I just rediscovered them again. I've been using different Garnier hair conditioners for some years now and at first I was disappointed but with time they surprised me a lot. My latest addition is from the Honey Treasures range and I mainly bought it because of its nice smell. I didn't expect too much honestly, but after two uses I realised that my hair is silky smooth after I blowdry it and usually it has a very rough structure and it just doesn't feel healthy ( even though it is). Now, I love touching my hair again because it is beautiful, shiny and as already mentioned, silky smooth. It looks so much better and it also smells great! I do however use quite a lot of conditioner and I nearly emptied the bottle already so I guess soon it will be time for a new one. So let's see if I get something new or if I'll stick to this one! But since it's affordable and it's availability is good too I totally recommend it! My Soap&Glory Righteous Butter, that I've had for over a year now. I used it a lot and it's nearly all gone now, but I had a pretty long break from it because I'm simply too lazy to use body lotion. And for this reason I knew it was time again to motivate myself for do something for my skin again. And then I remembered that I have the righteous butter in my room and from that time I've been using it before bed time and my skin looks already so much better! It's still soft throughout the whole day and I love it! 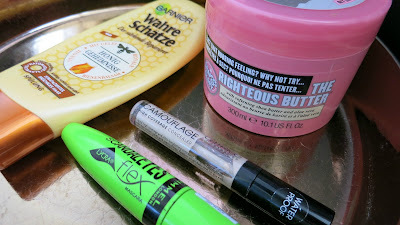 And the last product for today is my Rimmel Scandaleyes Lycraflex mascara, which is SO cheap and SO good at the same time. I usually got it in Edinburgh for arounf 7 pounds but then I realised they are even cheaper in Poland so I always get one when I'm there. They last me for ages somehow and I feel like from all the other drugstore mascaras I've tried so far, this one is seriously the best for me. I mean, there is still Perversion, Rollerlash and Chanel that are amazing BUT the prices...you know. So when I can't treat myself to a Benefit Rollerlash or Chanel or Urban Decay Perversion mascara, I'm perfectly fine with this mascara too! ( However, it's just the green one that works great, I had the black and orange one and was rather disappointed). This mascara has a big brush and it does make my lashes longer and when it's not pretty empty it does make them really voluminous too, so it does everything a woman would want! Amazing quality, amazing price! That's all I need to say. This is so true!It's simply amazing! !